Do you need to change the look of your front entry to your house? Do you need some features that will not only say “home sweet home” but that will also make your guests fall in love with your house? You can do all of this with only a few minor changes. Renovating your home can be a stressful process, especially if you have to stay in your home throughout the renovation process. It will get dusty and miserable having no kitchen or lounge area for instance because you’re redoing the floors or knocking down walls and so forth. When it comes to doors, especially wooden doors, you will discover that there are many businesses that offer wooden doors in Nelspruit. All the shops have to offer come in an array of shapes and sizes and if you cannot find what you are looking for, you could have the wooden door you need custom made. Doors and windows are probably the first part of your home that your guests will see. Coming from the driveway or front garden and towards the house what visitors will see is the doors and windows. In most cases, the perfect door and window could make a large difference in giving the exterior of your house a better look. Wooden doors in Nelspruit are common amongst many home owners because it has many positive features about it. When it comes to looks, wooden doors can outshine the standard type of doors that are made with different types of materials other than wood. Wooden doors in Nelspruit comes in different designs and you could go from a standard look to a custom designed one. Wooden doors have great insulation features, however when being built with a glass window into it, the door would have to be manufactured to incorporate the original insulation aspects. Wooden doors are not 100% weather resistant because once wood is made into furniture, it is vital that it has to be protected over time to maintain the health of the wood. 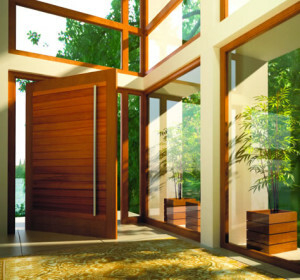 When wooden doors are used for outdoor specifics, treating the wood becomes even more essential. You are not limited to using wooden doors for your house or entrance gate, but often garage doors are also made from wood and are usually much more durable than metal doors. Garage doors that are manufactured using wood will provide good insulation, keeping the cold out, which will be better for the items you may have stored in it. Wooden garage doors should be treated thoroughly in order for it to last longer and to stay in good condition throughout summer and winter. Girelle Trading specializes in all wooden doors as well as wooden windows. You can also choose from a variety of wooden furniture and custom-made pieces to fit into the look of your newly renovated home.